If I’m going to give credit to the directors that have influenced me throughout my life, I would be remiss to neglect one of the most influencial filmmakers of my young years. Randal Graves once said there is “only one trilogy,” but it isn’t Star Wars 4-6 and it isn’t Lord of the Rings. It’s not even Indiana Jones, though it is a tight race (maybe even a coin flip’s difference). The trilogy above all trilogies is Back to the Future and the director in question is none other than Robert Zemeckis. To be honest, I tuned out when Zemeckis got into all of that mo-cap stuff. I just hate that style of filmmaking. It’s an incredible tool when used well to create realism and believability in films like King Kong, Rise of the Planet of the Apes and Lord of the Rings, but when stretched beyond its strengths the technology destroys the cinematic experience. In an animated film, one of the key challenges is finding that balance between over and under-defining characters. A Pixar artist will add just enough detail to be breathtaking without going too far and making an awkward, eerie, too real representation. When a film relies entirely on mo-cap technology the composition becomes muddled and it makes the job of the director so much harder than it should be, because ultimately he has to decide when it looks right and it almost never will. Motion capture has the potential to be ultra realistic and yet it is the job of the artists to create a balanced look, or the contrast between realistic and cartoonish features clash on screen and can be impossible to adjust to. Some films have to be animated. Some are better as a live action feature. No film ever needs to be mo-cap in it’s entirety. However, despite his apparent over reliance on cutting edge technology, nobody incorporates state of the art tech into brilliant storytelling quite like Zemeckis. I think of him as an efficient Spielberg/Cameron hybrid. Take A Christmas Carol. Though it failed to work as a whole in my opinion, there is some really great stuff in there that I think only could have been pulled off by Zemeckis. Zemeckis made the riveting thriller What Lies Beneath and Forrest Gump, which I happen to just have been listening to Alan Silvestri’s score from. but what really sets him up as one of my favorites is that he made Who Framed Roger Rabbit? Another massive technological achievement, Who Framed Roger Rabbit combines China Town with a wacky world in which animated characters interract with humans. It’s one of my favorite movies as I love detective stories and film noir and I think the collaboration between the major animation studios is an achievement in itself (Daffy Duck and Donald dueling pianos!). This film captured my imagination unlike any other. I had seen Pete’s Dragon of course and portions of Song of the South, but for the first time the combination of live action and animation felt real to me and Toon Town, became a destination within my fantasies. This was all happening in the midst of my obsession with Back to the Future which further cemented Zemeckis in my mind as a force to be reckoned with. Though I was only 8 when Back to the Future part 2 came out (I desperately wanted a hoverboard) Robert Zemeckis next to Steven Spielberg is the first director I was actually aware of in a time when I was still learning to distinguish actors names from the characters they played. Incidentally, Michael J Fox was my childhood hero on the strength of his roles as Alex P. Keaton, Teen Wolf, and of course Marty McFly. I’m still immensely fond of him. So, Zemeckis gets bonus points for being responsible for part of that trifecta. Back to the future is one of the greatest films of all time. I think it speaks volumes that it has survived so many other time travel and special effects movies of the decade, but I hope it will remain forever considered a classic. Every generation should know and love the film. It’s just so fun and clever and polished. The characters are brilliantly developed. The story is deftly plotted, piling set-up upon set-up for a lineup of the most amazing pay-offs. It’s so thought out and thematically supercharged, yet so whimsical and light and full of terrific dialogue. While it carries itself like an average teen comedy it is so exceptional it is truly next to nothing in terms of its inherent value. And if you want to talk about influece, lets talk about the torment I went through waiting for the third installment of the trilogy after Marty came back to 1955 and scared the hell out of Doc Brown. The “To Be Continued” card was devastationg! There is also something brilliant in the seemlessness of parts two and three, because they are a seperate story yet they have a momentum to them that makes the three part set feel like a whole. 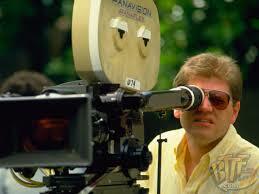 Zemeckis has range, too. From the wacky dark comedy of Death Becomes Her, to the Science fiction drama of Contact, to the solitary and desolate feature Cast Away, Zemeckis has revealed himself to be one of the industry’s top storytellers. What Lies Beneath, without the Z factor could have been shuffled away as just another Ghost story, but if you weary of the same tired concepts, Zemeckis’s creativity is a breathe of fresh air for the genre. Another one of my favorites is Romancing the Stone, which I watched often as a kid. It had everything I wanted in a movie and I never tired of watching it. Now, I see it and I’m not exactly sure why I was so into the film, but at the time it was one of my favorites and certainly served to influence my tastes and expectations at an early age. At home in Chicago, Zemeckis found creative freedom in an artless home through the family’s super 8 camera and became impassioned when he learned about film school on an airing of The Tonight Show. Though his parents strongly cautioned him, he applied for USC and though originally not accepted, he made a phone call to the admissions office and begged for a place. It was at USC that Zemeckis met Bob Gale, the co-writer of Back to the Future. The fact that he does a good deal of screenwriting and directing I think goes a long way toward making him one of the most effective and influencial storytellers of the last thirty years. It was his expertise in incorporating special effects that imbued me with a thirst and excitement for knowledge about how films are made. By addressing my belief in what I saw on screen, and learning a bit about behind the scenes planning, I began to piece together how to make the unreal appear real and put that skill to work for the first time, using forced perspective to create a monstrous giant in a student film of David and Goliath when I was twelve. Though my dream was to become an actor, Zemeckis had opened a window that would eventually push me behind the stage and onto a computer which introduced concepts and production aspects I never dreamed of and eventually lead me to screenwriting.